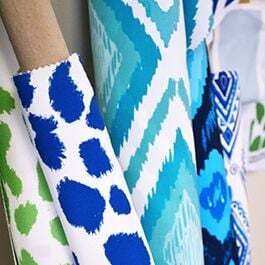 Which fabrics do you print to? We print on both natural fabrics and synthetic polyester fabrics. Polyester referrers to the fibre content of the fabric. 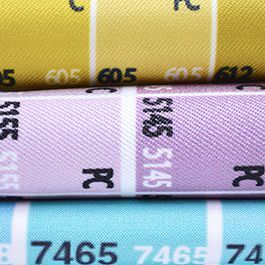 We have a standard range of fabrics for a wide range of application, from fashion and swimwear fabrics to interior and soft furnishings. Our minimum order is 1 m for custom printed fabrics and 1 cushion cover for custom cushion printing. For custom fabric printing services our standart turnaround is 5-7 working days. Custom cushion covers 10 working days. Express orders 24 hours to 4 working days. Do you offer colour matching ? Yes, we do offer colour matching services. We can either colour match to provided Pantone colour or physical swatch. We do not match colours to the computer screen. What digital files are accepted for printing? Fabric Uploader accepts JPEG images. For One on One service we accept JPEG, EPS, TIFF, PDF files files in RGB colour format. See more about artwork requirements here. Do you accept customer supplied fabrics? Yes we do, subject to testing. 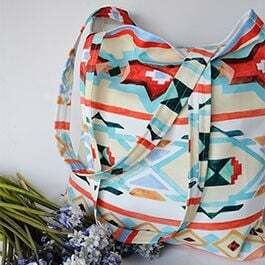 See more about supplying your own fabric here. What type of artworks/designs can you print? We can print any numerous styles of artworks and designs. 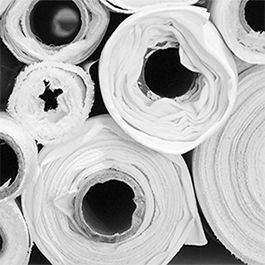 We can print in seamless all over repeat, panel photographic prints, banners, swimwear mark-ups, placement prints for fashion garments or cushions…you are only limited to your imagination and project requirements. Files can be uploaded via Digital Fabrics file uploader. Can you help me with my artwork? Yes, we have a cleaver design team that can assist you in developing your artwork from the outset or reworking existing files to get them print ready. Just ask for a quote here. Are there any printing limitations? We are limited to a max print width of about 145cm on most of our stocked fabrics. We will also not print any copyright infringed artwork. Our standard lead time for printing is 5 working days from payment in full, strike off/print proof approval or terms and conditions acceptance. Freight times vary depending on location. We’re based in Sydney, but we have shipped to customers all over the world-New Zealand, Europe, US and all over Australia – Brisbane, Melbourne, Perth, Cairns – Australia wide shipping is fast and competitively priced. On top of our standard printing services, we can also assist you with graphic design, finishing services such as banner requirements and sewing of cushions, bikinis, leggings, tea towels, pillow cases, tote bags and scarves. Ask us for a quote here. Please contact us here, we’ll be happy to answer.